SEOUL, Oct. 16 (Yonhap) — South Korean cinemas sold 32.2 percent more tickets in September than a year ago thanks to the long Chuseok holiday week, data showed Tuesday. According to a monthly report by the Korean Film Council (KOFIC), the number of admissions in local theaters was up about 4 million to 16.81 million last month, with sales jumping 41.8 percent to 144 billion won (US$127 million). The sharp rise is due to the fact that the Korean harvest celebration, which is Aug. 15 on the lunar calendar, fell in September this year, while there was no Chuseok holiday the same month last year. For Korean films, September admissions spiked 96.5 percent to 11.76 million, finishing as the second-largest September of all-time behind the 2013 record of 12.8 million. Their box office total also increased sharply by 113.6 percent to 100.8 billion won. The admission hike was tugged by the popularity of four big-budget Korean films — “Monstrum,” “Fengshui,” “The Great Battle” and “The Negotiation” — which opened days before the start of the five-day holiday. All of the four films cost more than 10 billion won to produce, twice the average production cost, including marketing fees, for Korean commercial films. But they failed to break even as of last Thursday because they had to split up the limited number of moviegoers, the report said. 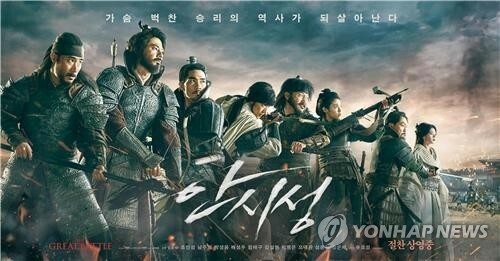 The number of people who went to see non-Korean films dropped 25 percent to 5.05 million, and the box office total decreased by 20.3 percent to 43.2 billion won. The KOFIC ascribed the decrease to a lack of wide-release films during the month.